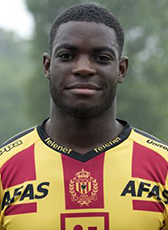 Stevy Okitokandjo moved at a young age to Belgium and has played for various Belgian clubs youth football. KV Mechelen loaned him out to KSV Roeselare in the 2014-15 season. One season later Okitokandjo was loaned out again, this time to Patro Eisden. Patro is a second league club in Belgium. In August 2016 he moved to Excelsior Virton, a third division club in Belgium. Okitokandjo departed from Belgium and went playing in Portugal in summer 2017. In the first half of the season he played at Leixões. In the second part he was on a loan deal at Olhanense. The striker is currently available on a free transfer when his contract expired in July 20189. Oktitokandjo is the cousin of Belgium footballer Christian Benteke.